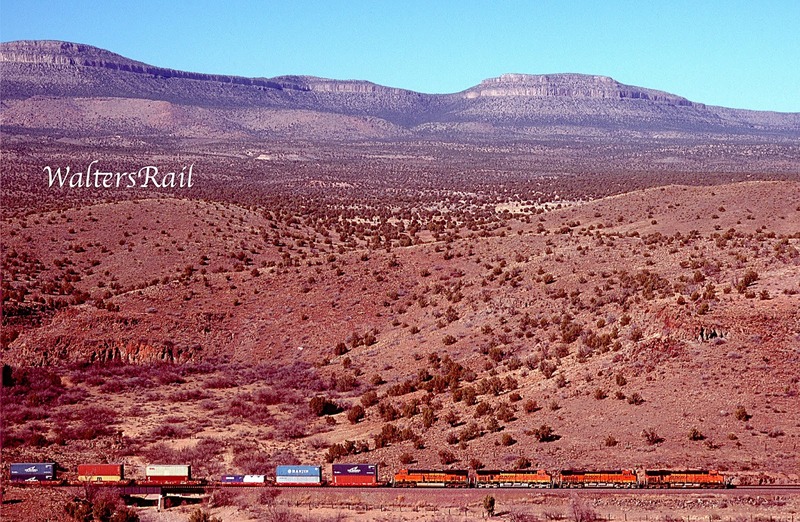 One of my favorite locations on BNSF’s Transcon is Crozier Canyon in northwestern Arizona. An earlier post – “Crozier Canyon and Truxton Canyon: Where the Waters Flow” – covers this same area but but does not give a good description of the geology nor does it contain any images taken from the top of the canyon. This post corrects both deficiencies. 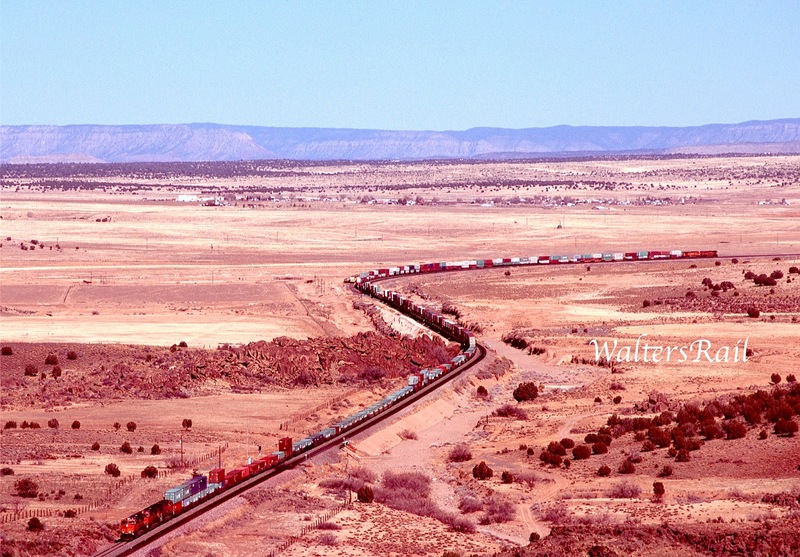 Here a westbound stack train prepares to enter Crozier Canyon from the east. 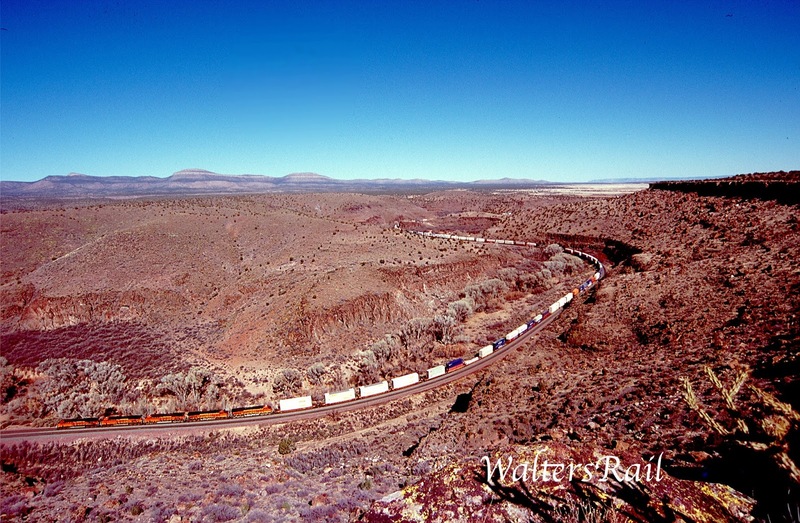 In the distance stand the Aubrey Cliffs, which extend across the Colorado Plateau on both sides of the Grand Canyon – the western edge of a gigantic limestone sheet overlooking an almost flat depression called the Aubrey Valley. 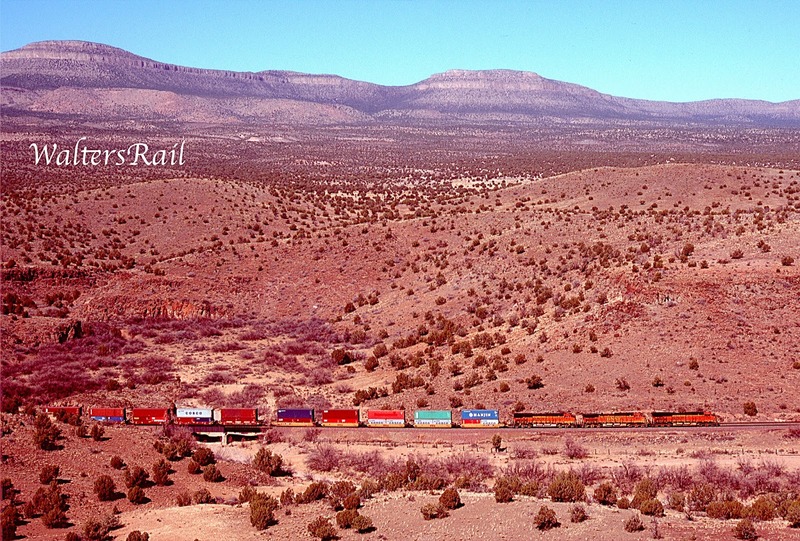 The Transcon follows the valley out of Seligman along the border of the lower red shale of the Supai formation and the upper surface of the Redwall limestone. 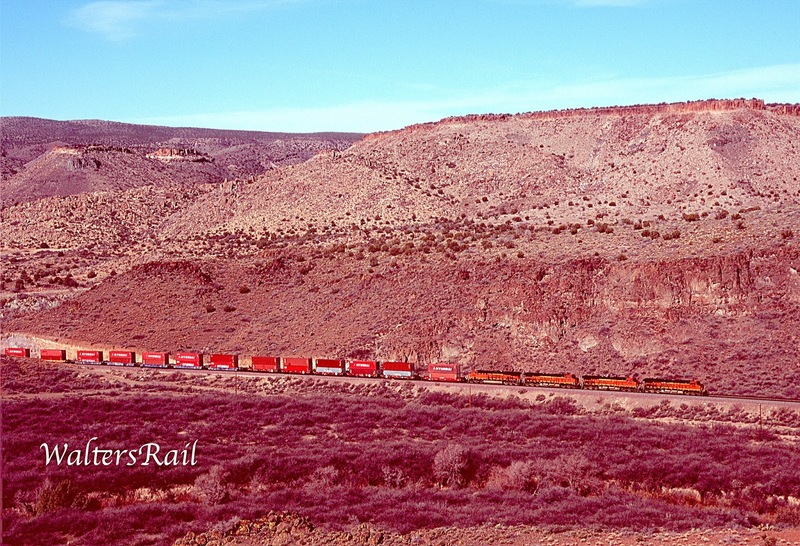 The tracks bear to the northwest to the summit of the plateau of Redwall limestone – one of several “steps” in the descent from the Colorado plateau, beginning at Riordan (the Arizona Divide) and continuing to the Colorado River at Needles, California. 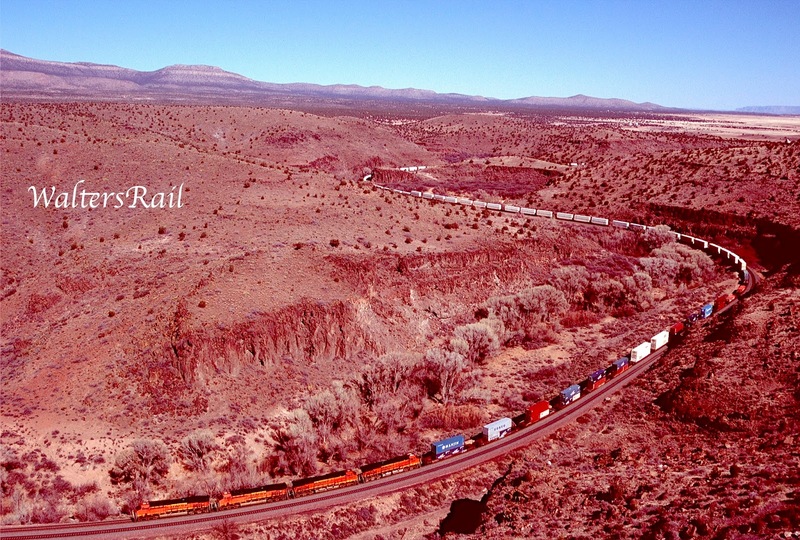 Notice also the lava flow in the left center of the image, stopping at the very edge of the tracks. The many volcanic eruptions in this era over millions of years helped create the eroded canyon that today is called "Crozier." 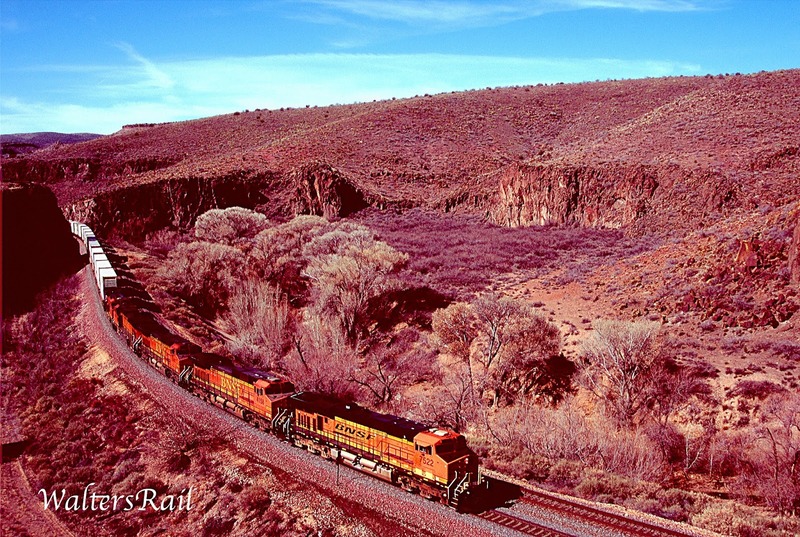 Here is a panoramic view of another westbound stack train winding through the depths of granite capped by a deep lava flow. 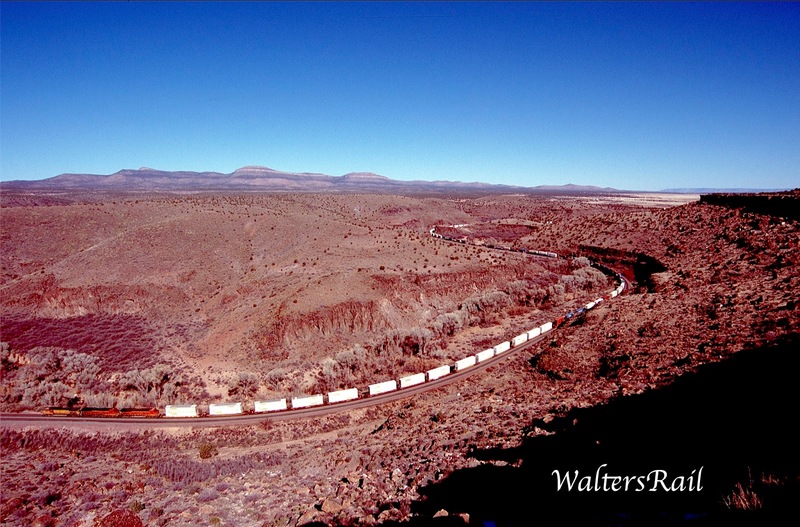 As you can see, the canyon, rather than plunging into a stream valley, burrows through a barrier that rises up from the valley in the background, as though millions of years ago a monstrous truck dumped a mound of detritus in the middle of nowhere. East of the valley to the rear can be found huge limestone beds weathered to light-gray, similar to limestone in the Grand Canyon. The Mescal or Maguey plant grows here. When mature, it produces a flower stalk 12 to 20 feet high. The base of the plant looks like a giant cabbage and is highly valued by Native Americans who roast it to obtain a sweet juice that, when fermented, yields mescal brandy. If you have not tried it, you should. The valley immediately east of Crozier Canyon is covered with sand and gravel washed down from mountain slopes. Where the valley merges into the Crozier Canyon gorge, one sees granite underlying the Tonto group -- a three-member sequence of Paleozoic rocks extending north into the Grand Canyon. This granite also extends to the base of the Music Mountains, high cliffs prominently seen from mileposts 475 through 476. The Music Mountains form the southwest corner of the Grand Wash Cliffs, which create a dramatic backdrop at Antares, 18 miles west of Crozier Canyon. The Grand Wash Cliffs extend south-southeast from the Grand Canyon-Parashant National Monument in northwest Arizona through the Grand Cliffs Wilderness and into the Lake Mead Recreation Area. 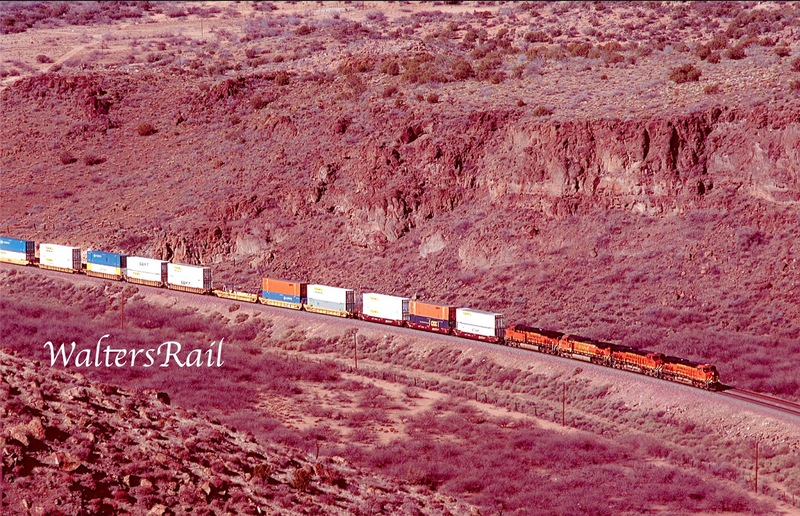 They cross the Grand Canyon where the Colorado River enters Lake Mead. 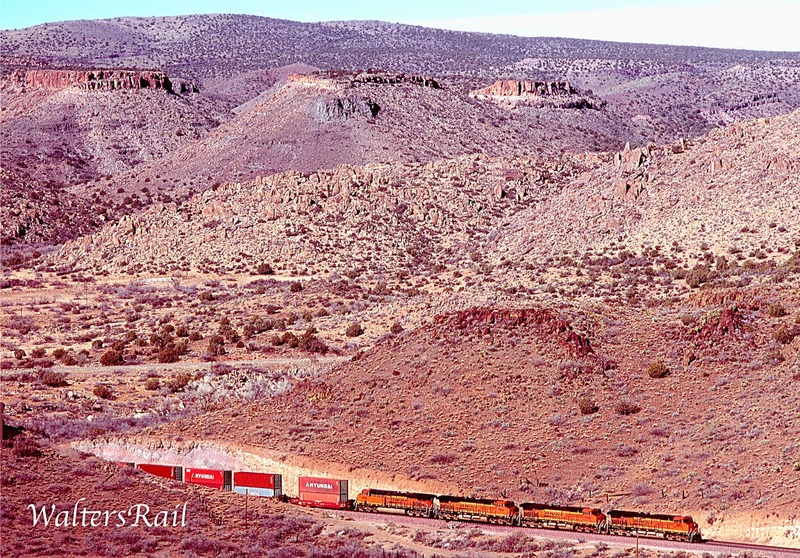 To the south, the cliffs continue past the east side of Grapevine Mesa and then southeast above and east of the Hualapai Valley forming the southwest margin of the Music Mountains. 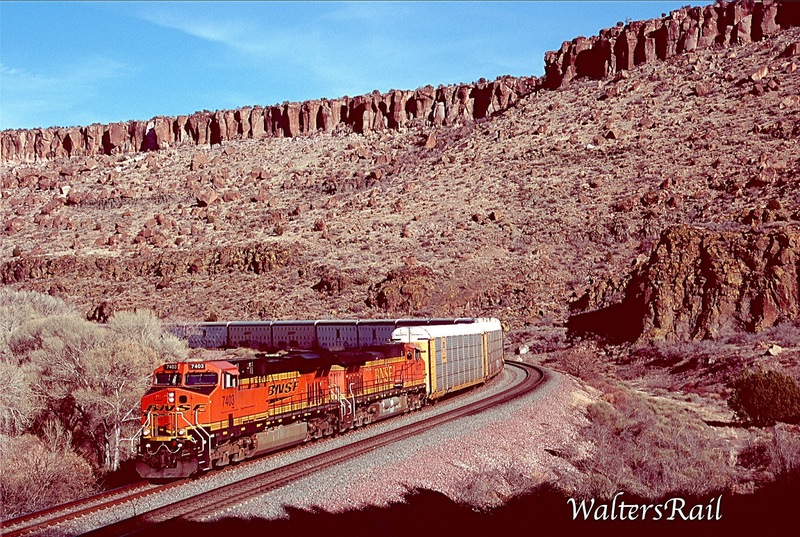 Although not technically part of the Grand Wash Cliffs, Crozier Canyon preserves much of the same scenery. And from the top of the canyon's south face, the Grand Wash Cliffs and the Music Mountains appear to be close enough to touch. The Music Mountains are capped by the lower part of the Redwall limestone, lying on 500 feet or more of sandstones and shale of the Tonto group, and have a long rugged lower slope of granite descending to the Hualpai Valley. The line of the escarpment is nearly straight. Part of its height is apparently due to a fault passing along its western foot, with uplift of 1,000 feet or more on the east side. East of Crozier Canyon, the same fault appears to cross the Transcon, again with the uplift on its east side, though not nearly as pronounced as at the Music Mountains. (See the second image above. The uplift occurs where the hills begin east of the valley floor.) 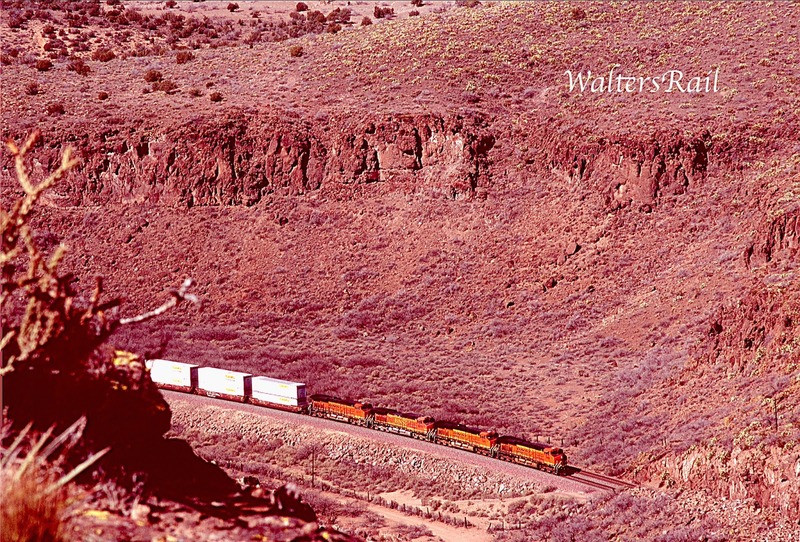 On the west side of the fault, the BNSF passes through the lava field that caps Crozier Canyon. 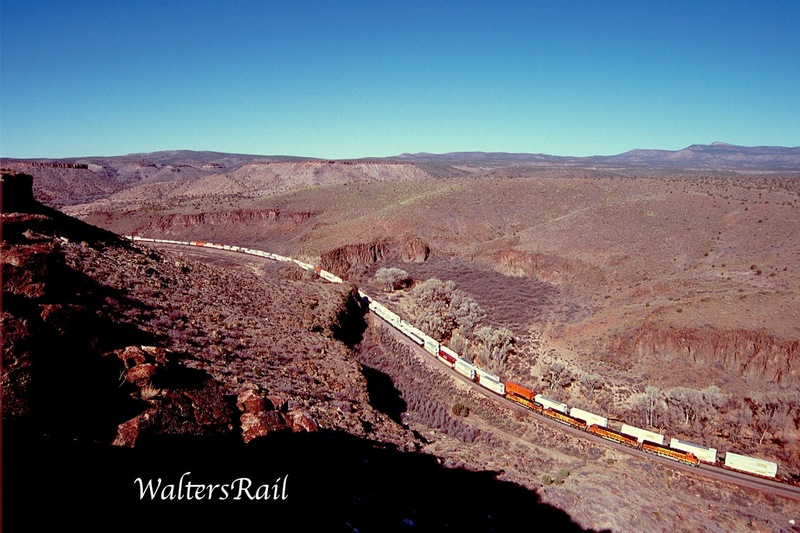 In Crozier Canyon, trains pass below the edge of the lava cap into a gorge in the underlying granite, which is prominent in the lower walls of the canyon nearly to Hackberry. The lava sheet has created a plateau north of the canyon, lying on an irregular surface of the granite, filling up valleys and burying low peaks and ridges. The lava cap consists of an upper layer of rhyolite and a lower layer of basalt. Rhyolite is an igneous rock with a high silica content, usually formed in continental volcanic eruptions when granitic magma reaches the surface. Basalt is a dark, fine-grained igneous rock composed mainly of plagioclase and pyroxene minerals. It most commonly forms as a lava flow and underlies more of earth's surface than any other rock. The lava cap above Crozier Canyon was likely poured out in fairly recent geological times -- the late Cenozoic; i.e., within the past 15 millions years. The presence of Rhyolite on top of Basalt indicates at least two separate volcanic events. Basalt is created from non-explosive eruptions flowing like hot tar across the landscape. For example, during the past two millions years, lava with that consistency flowed into the western portion of the Grand Canyon near Vulcan's Throne at least a dozen times, temporarily damming the Colorado River. Thus, the initial lava flows across what is now Crozier Canyon created large pools of hot, sticky material that cooled into basalt. Probably a million or two years later, a second series of eruptions occurred. These were explosive, much like the eruption in 1980 at Mount St. Helens in Washington. The lava accompanying these eruptions was rich in silica and therefore less viscous (less fluid) that the basaltic flows. Most of this lava solidified as Rhyolite. Moreover, because they did not flow easily, if at all, the Rhyolite deposits lie today where they fell years ago, unlike the basalt layers, which could have flowed hundreds of yards or even a mile or more. 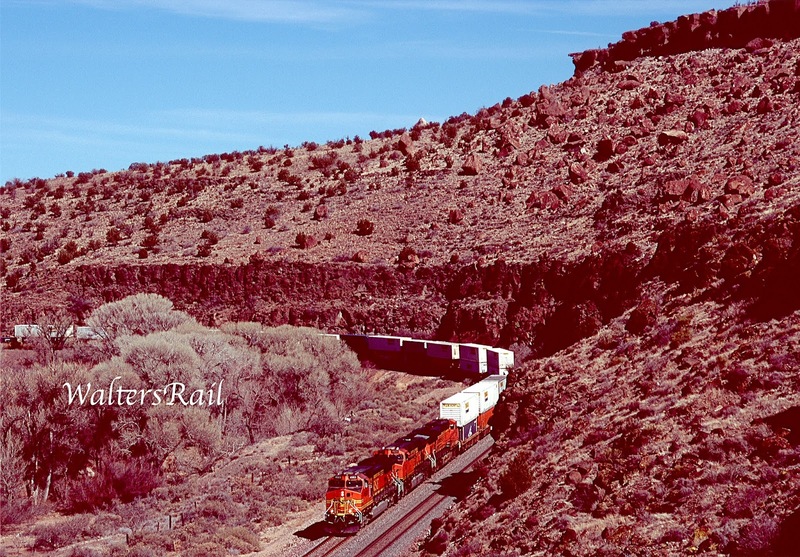 Here an eastbound stack train is climbing the grade toward Crozier Canyon. 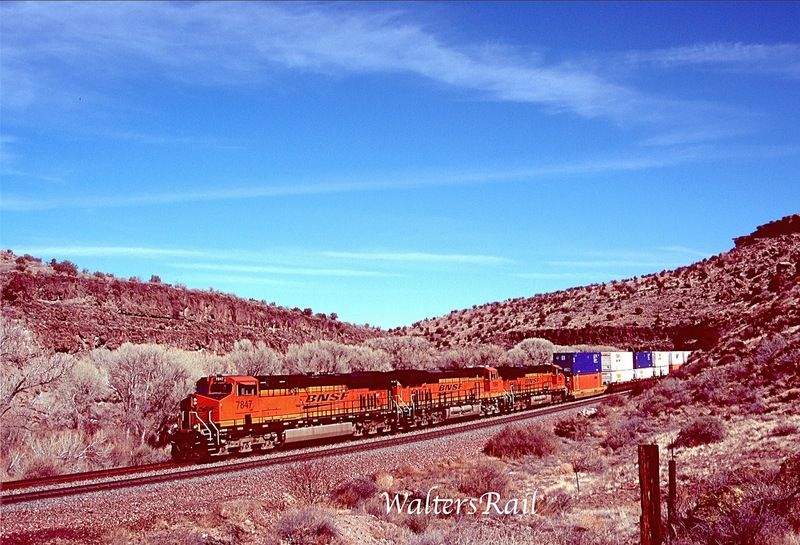 From Needles, California, to Riordan, Arizona (the top of the Arizona Divide near Flagstaff), the Transcon climbs almost 7,000 feet in about 200 miles. 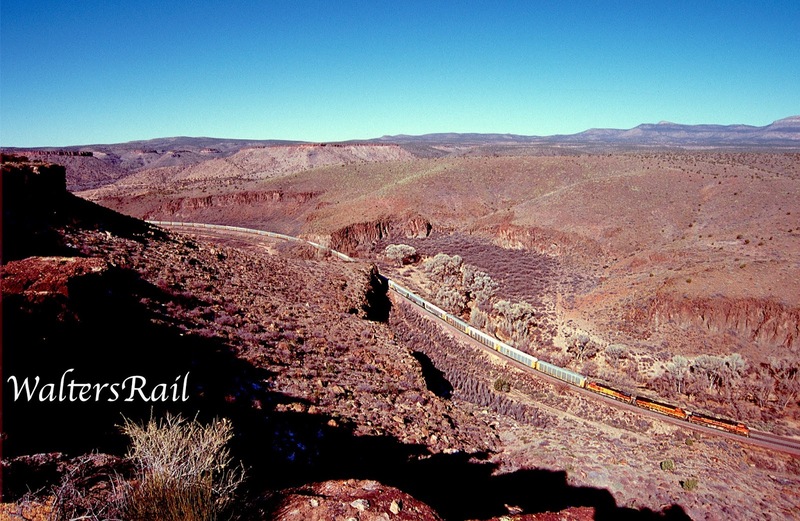 Basically, the railroad climbs three distinct steps to reach the San Francisco Volcano Field on the Colorado Plateau. 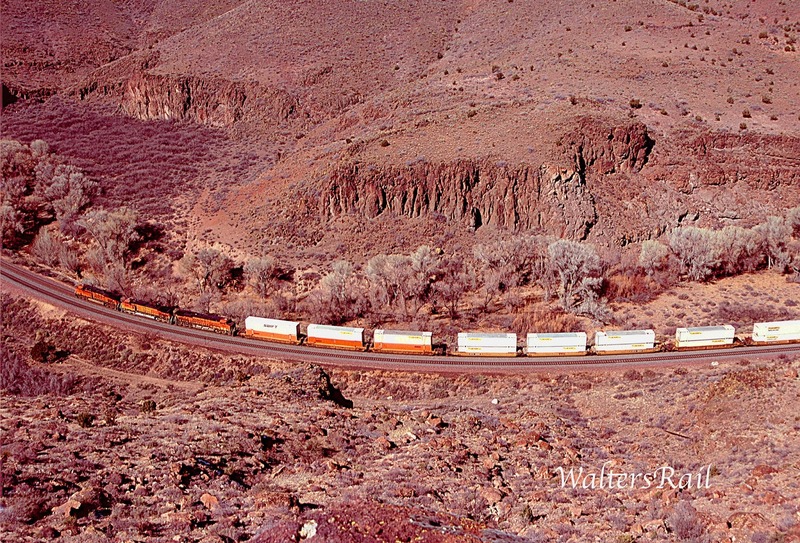 The first is the long continuous climb from Topock to Louise -- which takes the line through Kingman Canyon. The descent from Louise for 10.9 miles to a point 1.7 miles west of Walapai entails a drop in elevation of 235 feet. A minor summit is crossed at Antares, 6.2 miles away, and then a 6 mile descent follows to Hackberry. The second major step begins at Hackberry and continues unbroken to the summit at Yampai -- elevation 5630 feet at mile post 451.9. This section runs through Crozier Canyon, where eastbounds struggle mightily against the grade, while westbounds glide downhill in dynamics. At Yampai, descending grades take the line down to an elevation 5197 feet at Audley, mile post 439.8 (distance 12.1 miles, with a drop in elevation of 433 feet.) Short climbs are required over two summits at Chino (elevation 5395 feet, mile post 432.7) and Crookton (elevation 5741 feet, mile post 418.2). 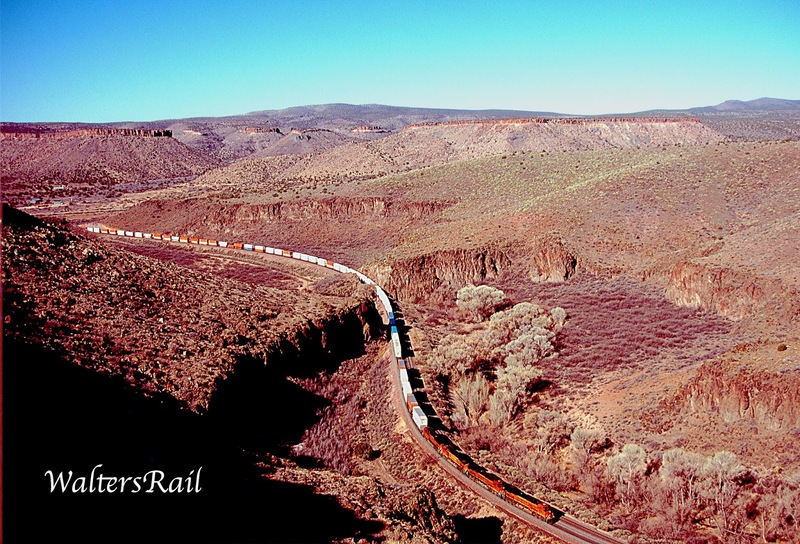 East of Crookton, the Transcon follows the Crookton Cutoff through some of the most isolated country in North America all the way to Williams, where the third step begins. From Williams to the summit at Riordan is only 27 miles in distance and 553 feet in elevation, but the ascending grade is 1.42 percent, against which eastbounds again struggle mightily. You may be wondering how Crozier Canyon could have formed in the past few millions years through such thick layers of lava and granite. Let's start with the granite underpinnings of the canyon. In geology, a stock is an intrusion of igneous rock that has "bubbled up" from below ground, usually with a surface of less than 40 square miles. Two of the best examples of stocks in western America are the Spanish Peaks in central Colorado. 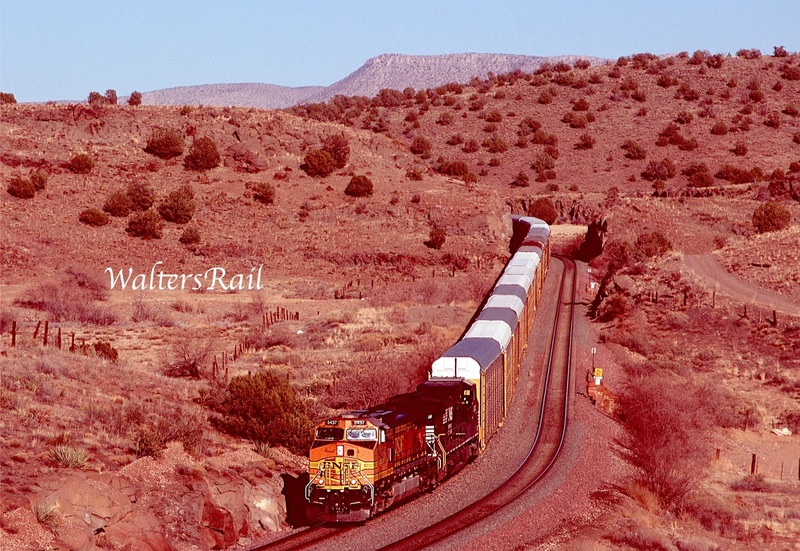 (To see several images of the Spanish Peaks, go to my post on the Burlington Northern between Trinidad and Walsenburg.) Stocks differ from batholiths only in size and in some cases may simply be the tops of batholiths buried below ground. 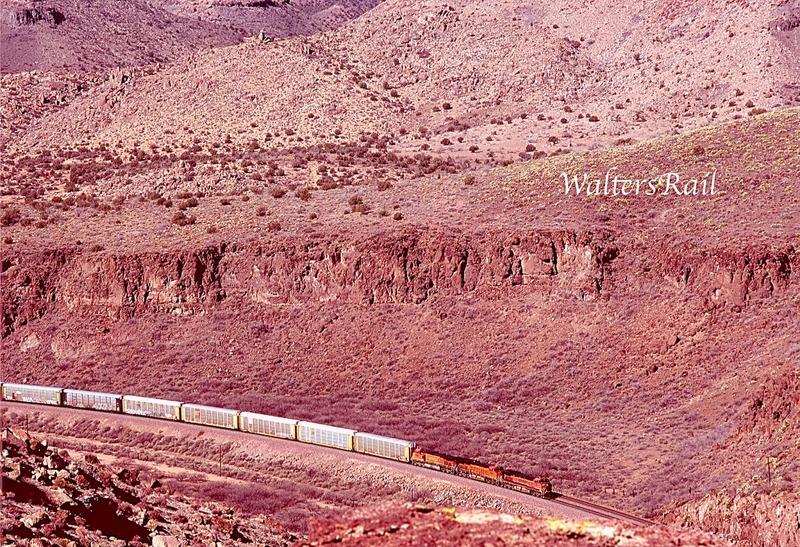 My best guess -- and I am not a geologist -- is that the granite in Crozier Canyon is part of a stock that extends north to the Music Mountains and southwest toward Valentine. 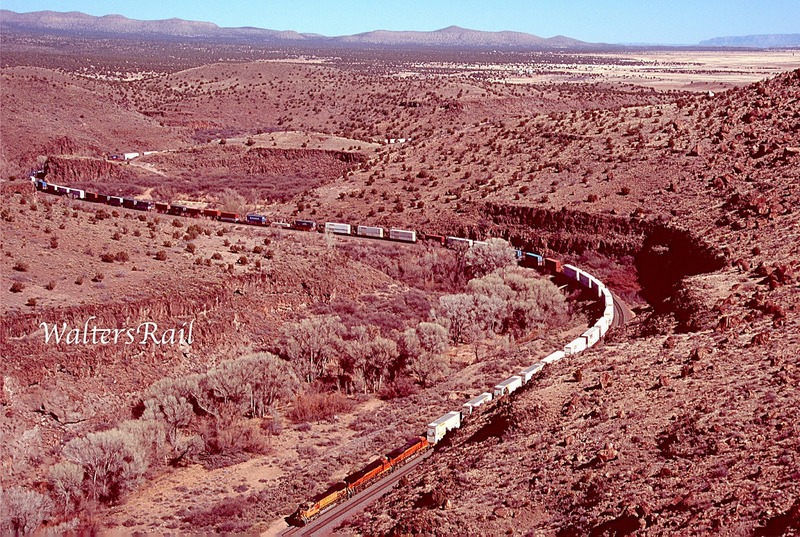 Old Route 66 follows the Transcon through Truxton Canyon, southwest of Crozier Canyon, and the granite is clearly exposed. It is possible that, at one time, millions of year ago, this area was a substantial mountain peak. This image shows a portion of Truxton Canyon. 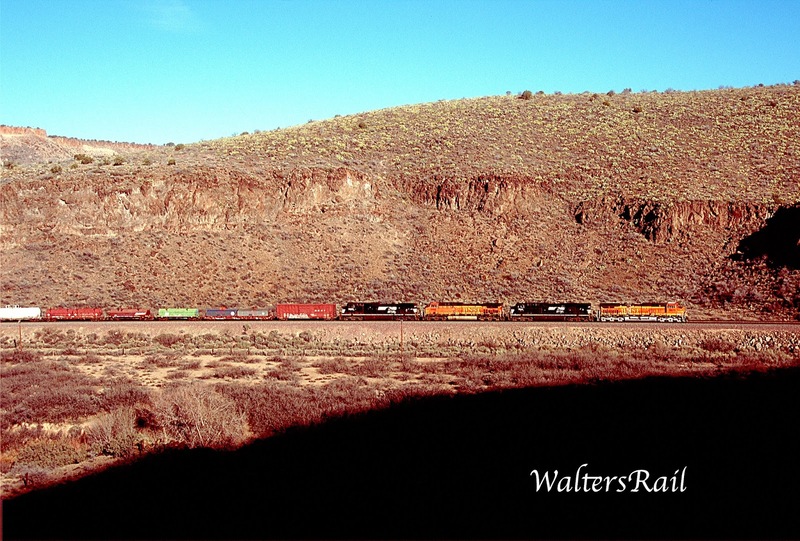 An eastbound stack train is about to enter Crozier Canyon. The ancient granite is clearly visible throughout the canyon walls, including the protrusion through which the eastbound is slicing. The lava cap above the granite is also clearly visible. Between the lava cap and the granite is material much more susceptible to erosion, which is why the granite and lava cap have formed sheer cliffs, while the material between has eroded at a shallower, though still steep, angle. The two separate volcanic events discussed above covered the granite stock and the material above with 90-130 feet of lava. Then, for millions of years, this huge protrusion sat immobile, while the lava cap slowly eroded. Sometime in the fairly recent past, a natural spring formed, and water bubbled to the surface, then began following the natural slope of the land to the southwest. The lava cap eroded slowly, forming an almost perpendicular trench descending toward the underlying granite -- a small scale version of the Royal Gorge in central Colorado. Once the stream hit the granite, one would have expected the erosion to slow even more. However, as the above image shows, the granite was separated from the lava by more pliant material. In this image, you can see below the lava cap where the granite has eroded in almost straight lines, much like the lava above it. In other places, however, the erosion has carved canyon walls at thirty to forty-five degree angles. So as the stream continued to erode, the softer material dissolved much faster, creating the angled canyon walls that we see today. Two springs now feed Crozier Canyon: Truxton Spring and Crozier Canyon Spring. There are several other springs in the area: Walnut Spring, Stone Corral Spring, Upper Grapevine Spring and Dewey Mahone Spring. All this water bubbling up from underground has carved what we now see as Crozier Canyon and continues to carve it today. The images in this post were all taken in winter, so the trees in the canyon have no leaves. But if you look closely, you can see tall, deciduous trees growing in an area where such vegetation should not be able to survive. But the springs that carved Crozier Canyon support the trees that grow along the waters that flow year around. So where does the water come? To understand why the area around Crozier Canyon contains so many natural springs, one must understand karst -- the name applied to areas underlain by soluble rocks like limestone. The term comes from the Karst region of Slovenia (part of former Yugoslavia) which is notable for caves and sinkholes. As rock slowly dissolves over thousands of years, caves are created. When the ceiling of a cave collapses, you get a sinkhole. Karst terrain is common on the Colorado Plateau of northern Arizona. Millions of years ago, this area was covered by a great inland sea. As marine animals died over the eons, their shells and skeletons sank to the bottom and, under intense pressure, fused into what we today call limestone, which is especially susceptible to erosion from carbonic acid. This compound is formed when rain picks up carbon dioxide in the atmosphere. Rainwater may also pick up CO2 as it passes through soil. Eventually, a week carbonic acid is formed which then eats away at limestone. If you place a thin sheet of limestone on top of a bucket, then continuously pour carbonated water over it, the liquid will slowly seep through the rock and eventually drip into the bucket. Be patient, however, for the process will take several generations. In my home state of Oklahoma, the Arbuckle Mountains south of Oklahoma City contain intensely folded and faulted carbonate beds that contain some of the highest densities of karst in the United States. Northwestern Arizona is similar. North of Seligman on old Route 66 are the Grand Canyon Caverns, a labyrinth of tunnels and caves carved into the underground limestone by flowing water. I'm told there is even an old motel where the rooms are all underground in the caves. I have never slept there, alas, and thus cannot confirm the story. A spring occurs when water flowing underground reaches the surface, often pouring out of canyon walls or other slopes. Water, hundreds of feet below ground, may flow down a narrow incline, while the surface above slopes more sharply. At some point, the running water will intersect with the surface, and a spring will form. I believe this is likely how Crozier Canyon was formed. The limestone on the plateau does not intrude into the granite and lava cap of the canyon. It appears to stop to the east, somewhere around the fault line discussed above. Thus, after the creation of the granite stock and the lava cap, water was running through the limestone caverns and crevices and following the natural slope of the land to the southwest, where it intersected with the granite and lava cap that we see today in Crozier Canyon. Water, hundreds of feet below ground to the east, flowed west until it reached ground level at or near the top of the lava cap. It then flowed out of the ground and over the lava, and the formation of the canyon began. 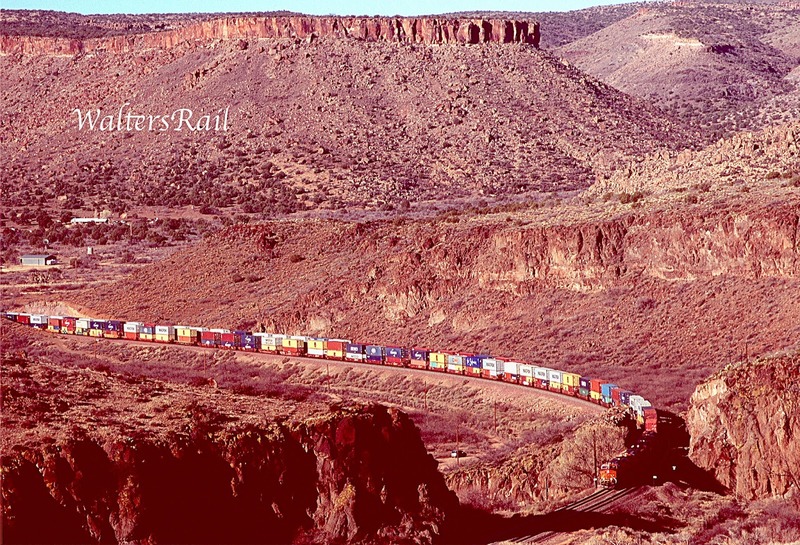 Here are westbound stacks in Crozier Canyon. The image shows both the lava cap at the top and the sheer wall of granite beneath. In between is material that has eroded much more easily and rapidly over the eons. As Crozier Canyon began to deepen, the valley to the east was also eroding. 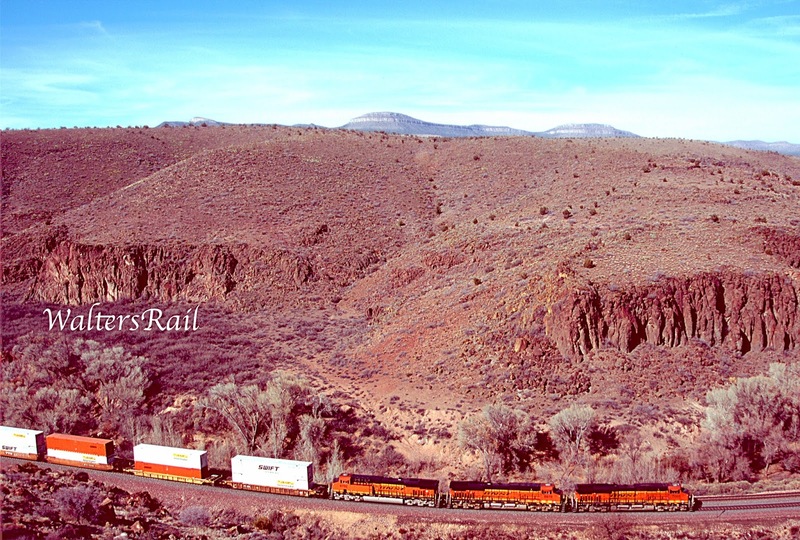 So today, if you are traveling on the Transcon west from Peach Springs, granite hills suddenly rise above you, while the tracks enter a narrow gorge through the rocks, and you wind your way the rather short distance through Crozier Canyon. As mentioned in my previous post on this area, the water still flows today -- the same as it has flowed for thousands, or even millions, of years. 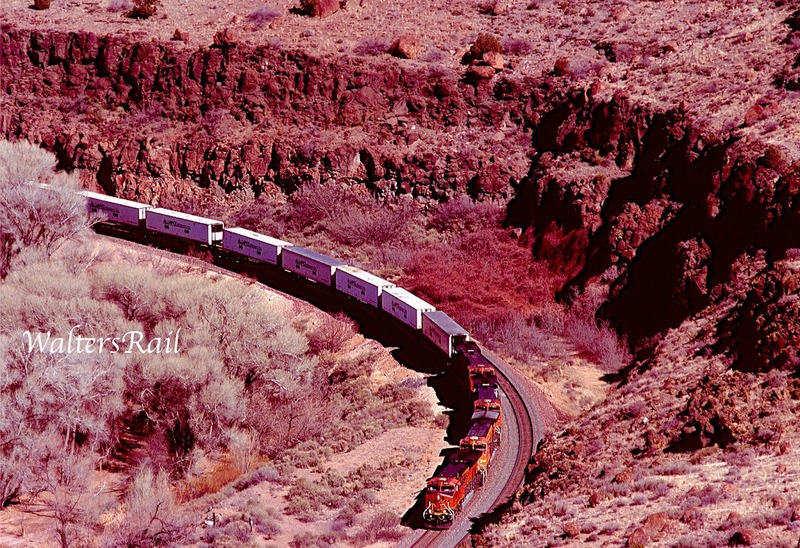 A westbound rolls downgrade through the canyon. 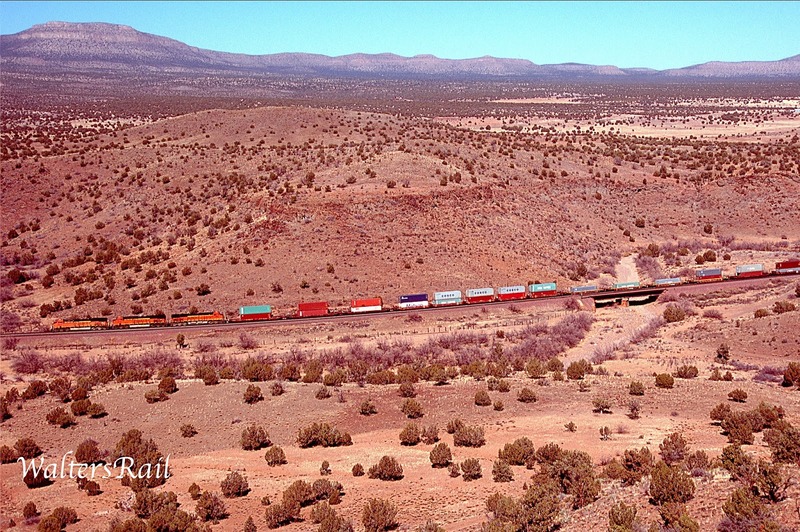 To the left of the train are the tall trees than line Truxton Wash, which is about 30 feet below the level of the roadbed. Most of the land in this area is either tribal land of the Hualapai, or else is owned by the Bureau of Land Management. 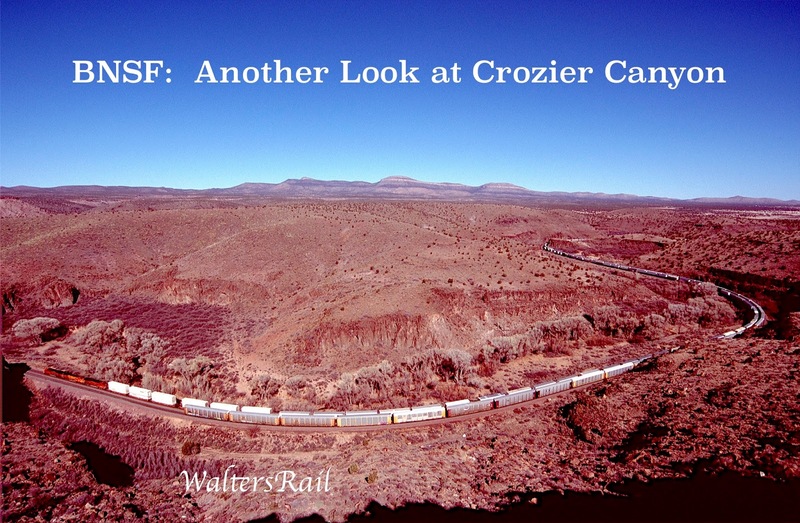 However, the bottom of Crozier Canyon appears to be privately owned. I say this because every time I have been there, I have found cattle grazing along the small stream that flows beneath the tall trees. Truxton Spring, the primary source of water through Crozier Canyon, is located beneath the trees to the left, just behind the last visible trailer. While searching the internet, I found a reference to "Crozier Ranch" at arizonascenicroads.com, where I discovered that in 1923, one C.J. Shank leased the property surrounding Crozier Canyon to cater to tourists along old Route 66. 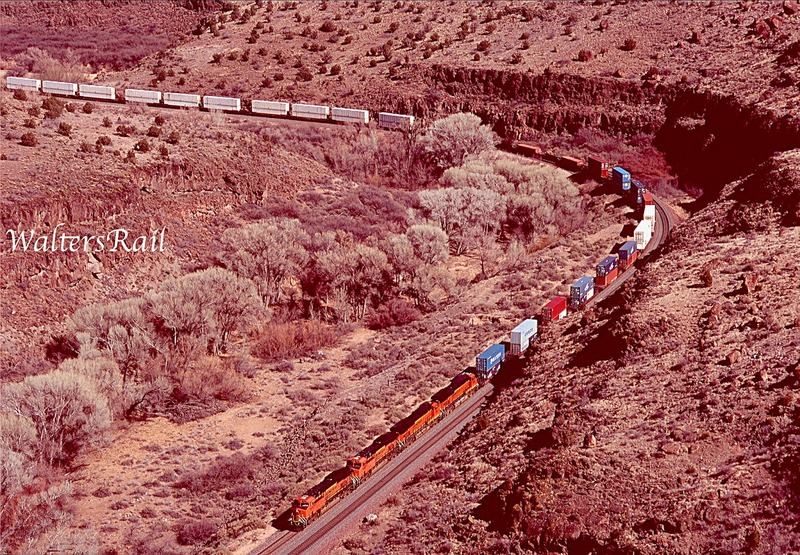 Shank built a swimming pool probably fed by the same spring that the Santa Fe Railroad used for its steam engines. To my knowledge, no trace of a swimming pool, nor any other tourist attraction, exists today. A small house is located north of the Transcon where the tracks begin to diverge from the old highway. Farther south along the road, ranch houses and barns climb the western walls of Truxton Canyon. But Crozier Canyon itself is devoid of habitation, looking much as it has looked for the past several thousand years. 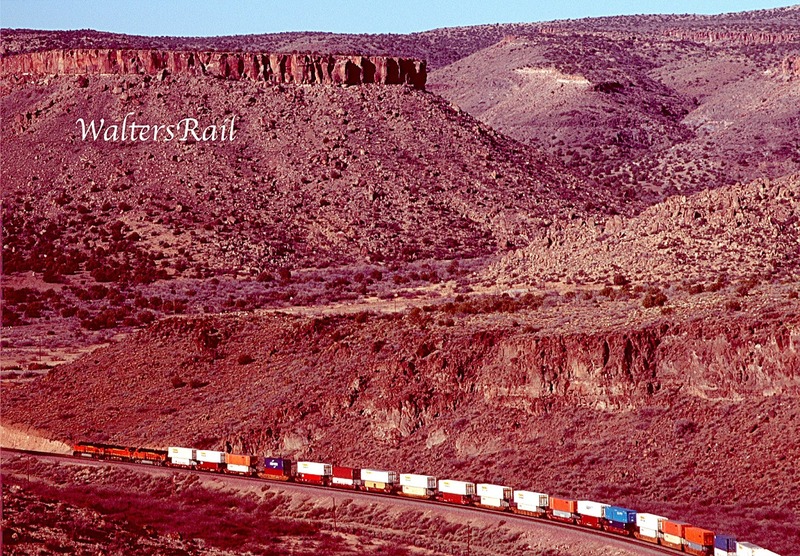 Like so much of the American West, Crozier Canyon displays its geologic history to anyone willing to observe. I suggest taking a look.